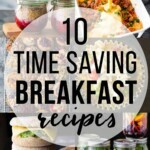 These healthy meal prep freezer breakfast sandwiches save you so much time in the morning! Prepare a big batch ahead and freeze for easy, healthy breakfasts. Spray a 8x8 inch baking dish with spray oil and set aside. In a large bowl, beat the eggs and milk together. Fold in the spinach, broccoli, salt and feta. Pour the egg mixture into the baking dish. Bake for 20-25 minutes or until cooked through (center should not jiggle). Allow to cool completely, then cut into 4 circles (using a glass or measuring cup) or into 4 squares. Assemble the sandwiches: one serving of egg with a slice of cheese between the english muffin. Thaw overnight in the fridge (if frozen). Heat in the microwave for 30 seconds to heat through. Crisp up in the frying pan or on a George Foreman grill.